The Art Gallery of NSW announces the exhibition calendar for 2012. The year 2012 begins and ends with major exhibitions focusing on two of the great figures in 20th-century art: Pablo Picasso and Francis Bacon. In May the Gallery’s Australian collection will return to renovated galleries with an Open Weekend with over 50 events celebrating Australian art and culture. 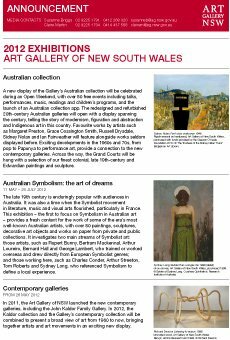 During May the Gallery will also present the first exhibition to focus on Symbolism in Australian art. The year would not be complete without the annual Archibald, Wynne & Sulman Prizes exhibition opening 31 March. And mid-year, the Gallery has organised two exquisite exhibitions: Eugène Atget: old Paris , about the father of documentary photography, and Kamisaka Sekka: master of modern Japanese art and design . Note: Exhibition details, including titles and dates, are subject to change. Check What’s on for the latest information.